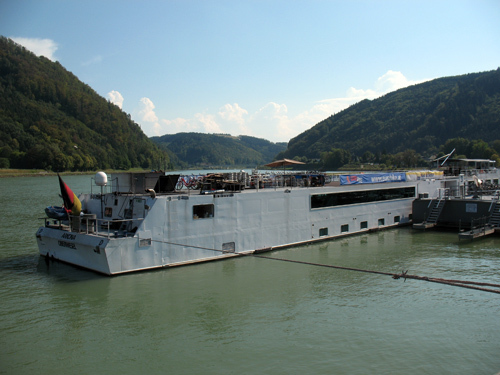 River cruise holidays on the Danube become more and more popular each year. Now, more than 70 80 river cruise ships weekly land in Passau during peak season (a picturesque city near the German-Austrian border). Some of the harbour cities even face issues with the local popluation (noise, waste, overtourism) and have to limit the number of landings. (Luxury cycling) Danube river cruises. The idea behind these holidays is that you ride every day. Alternatively, you are able to skip the cycling and stay aboard. Cyclists leave the barge behind in the morning and meet the ship again in the afternoon at the next port. By the end you will have cycled several bits of the Danube cycle path. These holidays are often marketed as 'bike-and-barge tours', by the way. Since there is so much to tell about these tours, we put it on a separate page: Bike and barge tours Danube. These are the longships, that you certainly know from the adverts at home. They typically cater for a maximum of about 180 passengers. 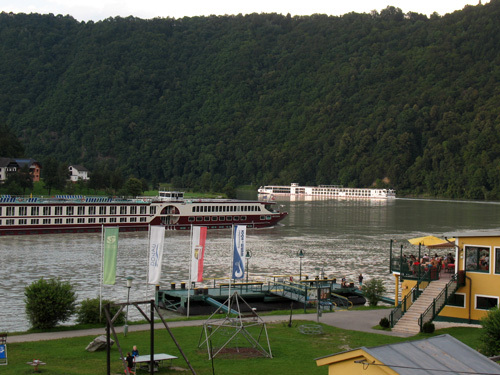 River cruises on the Danube existed for many years. However, only in recent years it became popular to offer excursions on bicycles as part of the cruise ships' program of acivitities. These excursions take about half a day, a couple of hours, and are led by either crew members or local contractors. Typically there are up to three excursions available, depending on the actuall itinerary of the cruise. Again, ask about your options to cycle before booking. In our opinion, a few half-day long rides isn't really 'cycling the Danube'. However, it's better/healthier than no cycling at all. 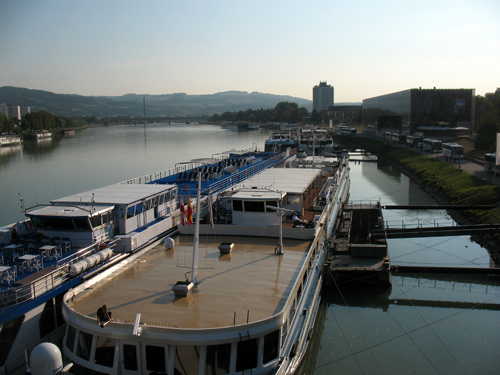 Following cruise lines operate river cruises on the Danube: CroisiEurope, Amadeus River Cruises , AmaWaterways , Avalon Waterways, Viking River Cruises , Arosa Cruises, Saga River Cruises, Scylla, Tauck River Cruising and Fred Olsen. This list is non-exhaustive and will never be. In 2015 North-America based cycle tour operators discovered the opportunity to combine their luxury bike tours with river cruises. The bike tour operator takes over a certain number of cabins and runs it's own itinerary. In 2017, CroisiEurope started offering such cruises too. For 2019, VBT joined the pack. Despite the remarkable (some say: ridiculous) prices, these "cycling cruises" (or: "cruise bike tours") seem to sell very well.